Unpredictable weather has altered bird migration patterns, with many arriving in Wales weeks earlier than expected, say experts. The National Wetland Centre in Llanelli said 800 curlews, not normally seen until late August, were early arrivals. About 100 redshank, 90 oystercatcher and 190 black-tailed godwit had also flown in early. The Wildfowl and Wetlands Trust (WWT) said the weather also affected breeding patterns. Another reason for the birds' early arrival might be that some of them failed to breed in Iceland. Pamela Styles, the WWT's learning assistant at Llanelli, said: "2012 has been a year of unpredictable weather, and many birds have already been affected. "We have heard chiffchaffs singing autumn calls in May, the flamingos have laid their eggs two weeks late, the gull-billed tern showed up having been blown off course, and now we are seeing the arrival of hundreds of autumn migratory birds - returning to us over a month earlier than usual. "Birds we normally associate with the autumn and winter have arrived on the reserve in numbers usually not seen until at least August, including over 800 curlew, three whimbrel, 10 greenshank, 100 redshank, 90 oystercatchers and 190 black-tailed godwits." 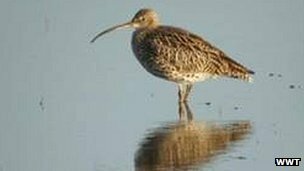 RSPB Cymru said the curlew was in sharp decline in Wales. A spokesman said: "The curlew appears to have had yet another difficult breeding season. Their numbers are currently in catastrophic decline in Wales as a breeding species." It is unclear why their numbers have fallen so dramatically, but RSPB Cymru is working with farmers to find out why in the curlew's last stronghold, an area of north Wales called Hiraethog.